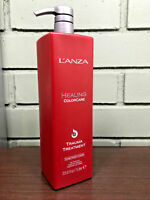 Lanza Healing ColorCare Trauma Treatment Hair Treatment 33.8oz PRO SIZE W/ PUMP! NIOXIN System 1, 2, 3, 4, 5 or 6 Scalp Treatment 6.76oz / 200 ml "Free Shipping"
Shade: Any Type Size: 3.5-7.9 oz. 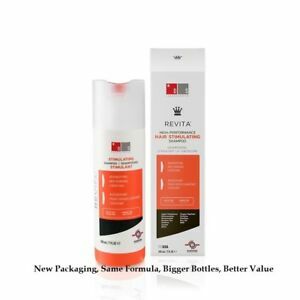 DS Laboratories Revita Hair Growth Stimulating Shampoo - 177 ml Revita offers powerful results on scalp vitality and hair growth stimulation. No question, thickens hair- fast! My hair has thinned out as I've become increasing balder in the front over the years. Tried this shampoo and the first time immediately noticed the thickening effect, which became obvious after styling and the hair dried. It wasn't stiff or unmanageable, just thicker in feel and overall looks. The application in the shower was easy and smooth-- not like some shampoos which don't seem to moisturize and spread out easily-- so even a small amount worked to foam up and clean. It also smells great, though not very strong and no lingering smell. It says to apply at least 5 days in a row, but I use it every day, sometimes combining it with a little of the other shampoos I like to use. Due to this high quality and immediately noticeable results, I'm tempted to try the conditioner next. Def recommend. I have only been using this shampoo for a couple of weeks, so too soon to tell if I might be getting more hair. Does a great job with hair, leaves it clean and silky. That is why only 3 stars ask me again in a couple of months and I may be ecstatic. I have thinning hair, so I've used Revita by DS Labs exclusively for over 1 year now, I started to notice results after 3-4 months. The product is designed to clean the follicle shaft, and to promote hair growth. It works for me, (72 year old female, in good health).Shampoo, Conditioner, Spray, all excellent products. I recommend leaving the shampoo on the scalp for 30 minutes prior to shampooing. You have to plan ahead, but you will be happy with the results, It's the best product I've used for thinning hair.I love it! I've been using this shampoo for a few years. I started using it after my hair became fragile and thin from over processing. I've always had baby fine hair, but lots of it. My hair is back to my normal thanks to this shampoo. I continue to use the shampoo because it is great. I highly recommend it. 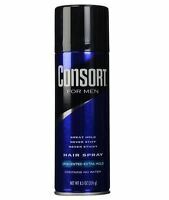 I have used this product along with DNC-N for four years and it seems to have slowed my hair loss. It was recommended for me by my wife's hairdresser who also continues to use this.